I must tell you about this one though, because I love it so. This fabric is my current favorite (My Secret Garden by Alexander Henry) – I already have the pink version of it set aside for a quilt backing, and the blue may become a shirt… too much? nah! I had a vague idea of what I wanted for this dress, and I’m pleasantly surprised that it worked out so well! 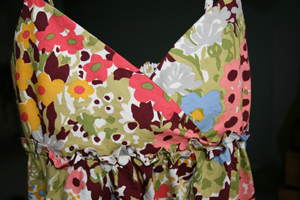 It has thin straps, a crossed top and a full skirt. And pockets, of course! It still needs to be hemmed, but I’m having trouble deciding on the length. 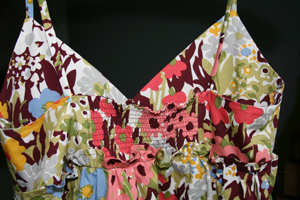 I didn’t feel like dealing with a zipper, so I inserted a small smocked section on the back, which allows me to pull it on over my head. I have a lot of dresses with similar silhouettes (that straight shift dress style), so I tried to create a different look with this one. I don’t think I have any dresses with a full skirt like this one, but I’m quite liking it. I think it will be a great little summer dress! Oh, and just so you don’t think that I’ve stopped quilting altogether, here are my first nine patch blocks for amandajean’s quilt-a-long. I wasn’t sure I’d enjoy making these, but it turns out they were kinda fun! 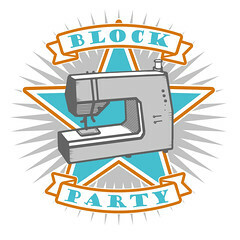 This entry was posted in Clothing and tagged Clothing, dress, handmade, nine patch, Quilt Blocks, quilting. Bookmark the permalink. 51 Responses to obsessed with dresses! The dress is beautiful!! Did you use a pattern? I am not tired of hearing of dresses. I love to see what other people make to get inspiration!! I LOVE dresses, so I’m thrilled with this– but it would be especially wonderful to read how you did it. creations, you do great work. Hey Jess! Thanks! I didn’t use a pattern, which is probably why I’m so pleased with how it turned out! I did see Amy’s dress earlier this week – I had to comment on it when I read it since I was just finishing up this dress in the same fabric! What a pretty dress! I have NEVER attempted to sew any type of clothing… are there any super easy dress patterns for beginners that you would suggest? OMG! HOW DID YOU DO THIS?? You’re such a pro. I’d totally buy this, or six of them. Actually, I think I have bought many such dresses, but this one is way cooler. I especially like the ruffle under the bust, and I think you should make it knee length. Tutorial? You smock too!!! You’re making my head spin. 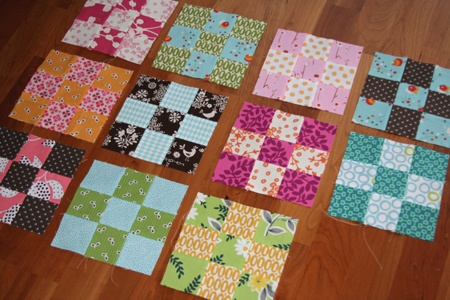 I am still working on two baby quilts that I started a month ago! I’m doing the quilt-along, too! It’s fun! I love this!! such a pretty dress!! I love the dress and the fabric. I stopped sewing for myself a few years ago as it always looked different than I wanted and then I didn’t like it…SO I think you are very brave and I hope your summer will give you plenty of time wearing it! Oh wow! That dress turned out so cute! 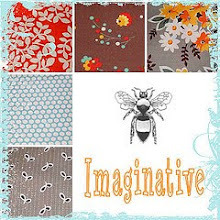 I saw the pics on Flickr and ran over to your blog to see which pattern you used. hehe. I’d love to start making some of my own clothes, but feel that I’d probably need to start with some patterns first before I branch off to my own stuff. Your dress looks great! sooo cute! Oh how I wish that I could successfully sew clothing for myself! One of my first dresses was Butterick 4443. I remember it being quite easy and the zipper instructions were particularly good. One that is similar to Ashley’s stunning creation is Butterick 5181. I haven’t made it, so I don’t know how it is to make up. I LOVE the dress – fabric, style – perfect and super cute! omg… I love your dress! You’re such an inspiration…seriously! Yes, please tell us how you did it! Gorgeous dress! Perfect for summer. So super cute!! Oh I’m jealous of your new wardrobe! i love your summer wardrobe! LOVE the dress! I tried to make something similar last week, but had trouble with the bodice. Kudos to you for pulling it off! The dress is Adorable!! I really want to make one like that! Are you kidding?! That dress is super, super cute! It’s the perfect little summer dress. I love the little ripple you put in the seam under the bust. Lovely squares too – beautiful colors! Oh wow! I wish I could sew like that. I love the fabrics! I already used it to make a dress for my daughter but maybe I need a grown up version for me too! Awesome dress! You have opened a whole new world to me now. I didn’t know smocking existed! Amazing. If you want to sew dresses for me, I’ll take it. Oddly I have no patience for sewing cloths. But you make me want to think about trying again. Wow – great choice of fabric! Love seeing all your spring wardrobe creations..especially because it has been getting so chilly here. Your start on the quilt along is impressive! I need to get cracking and hope to catch up over the weekend. Very pretty … so perfect for summer. I loooooooove this dress. I think it is awesome! I so want to make this for myself. I am going to have to work on trying to figure this out or get a similar pattern! Good job! Oh, c’mon! You cannot post such gorgeousness and not give us a tutorial!!! Please, please, please, please!!!! Oh this dress …LOOOVE it.And the fabric is beautiful. This is beautiful! The fabric choice was perfect! I would love a tutorial as well!! Beautiful dress! The weather got really hot here last week and I realized I need some new dresses in my wardrobe. Did you use a pattern for this dress or make it up on your own? like the others, I’m quite impressed that this is a no-pattern-dress! I can do skirts without pattern, but haven’t dared anything that constricts breathing 🙂 Do you go through a lot of re-sewing seams as you try the growing dress on or do you have some kind of dress-doll to fit the dress as you make it? and voila, a dress-doll that’s EXACTLY your shape! Really great dress – love that print to – i’m the same way when it comes to a fabric i love – i use it over and over. Very summery!!!!! This is BEAUTIFUL fabric. I cant believe you made this!!! Did you use a pattern??? Great idea to change the back in order to not use a zipper. Love your dress and how it turned out. This is exactly the style I was looking to make! Can you share how you managed to create the shape for the bust area? I’m a newbie and just working on patterns first to familiarize myself… Thanks in advance.